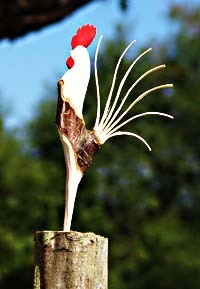 Brad Smith’s distinctive hand-carved roosters provide humorous social commentary as well as decoration. Brad’s roosters are becoming a favorite gift item in Floyd because you can always find one that suits the personality of the recipient. His roosters range from this cheeful cheerleader dedicated to starting off the day with a rousing crow at the crack of dawn to jailbird roosters and colorful fops who would not look out of place in the most refined salons in a big city. 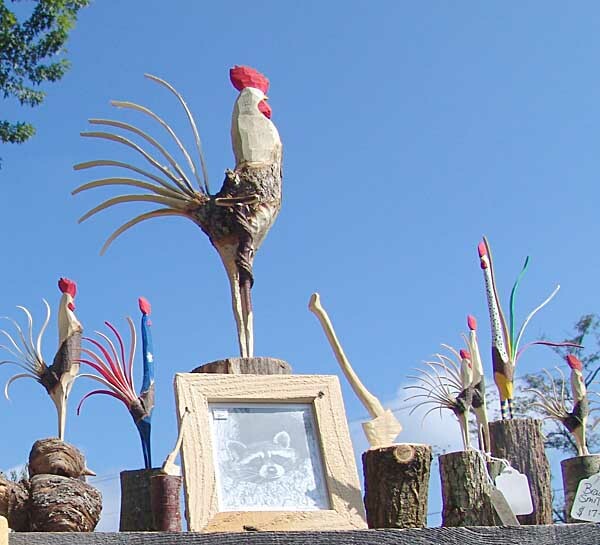 In his craft fair display to the right, you see a one-legged rooster with a crutch surrounded by a group of roosters which include a patriot rooster and a colorful dandy with a multicolored tail and fanciful stockings. Click on the images to see the details. Brad is an Appalachian folk artist who works in both greenwood carving and drawing. He has established his own techniques in the process. In the image below, you see him forming parts with a draw knife at a bench he designed and built. His professional background includes building log homes specializing in hand-hewn log techniques. He is well known for his hand-made woodcraft and his drawings can be found in galleries and restaurants in Virginia and North Carolina. 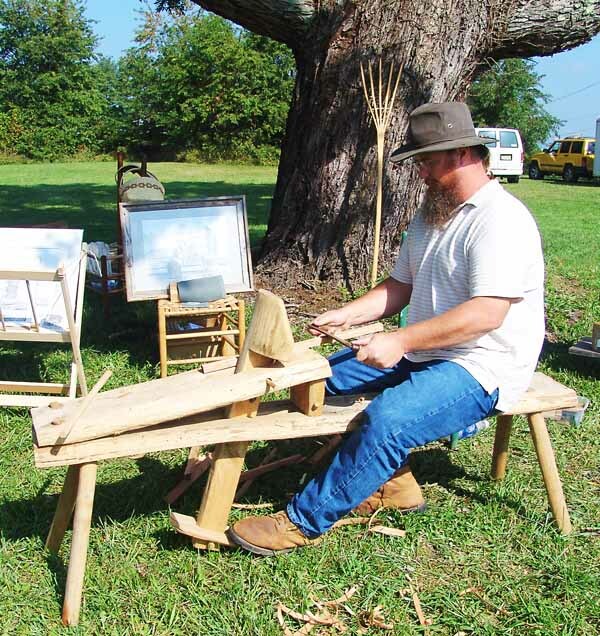 He is also one of the instructors at the Jacksonville Center, and will be teaching ladder-back chair making and old time whittling during 2007. This entry was posted in Floyd Artisans/Craftspeople. Bookmark the permalink. I saw this young man and his work at the Crooked Road Christmas Show in Hillsville. Impressive! Hey you , I found your web site . It is really nice !!! Talk to ya soon .